I am interfacing to an EEPROM that works via SPI at 1.8V; unfortunately I do not have a 1.8V power source around and being this a weekend project, I wanted to complete it without going to the shop. I asked a skilled friend an advice and he suggested I could put a 1.5V AA battery in the circuit to get 1.8V. Is this a sound configuration? I am a newbie but by gut feelings I feel there is something wrong, in particular regarding current intensity. Edit 1: I know this is a bad idea, but I am asking here to know why. I could not find a similar question so I believe it will be useful to have here as a reminder of why not to pursue bad ideas like these. I will accept the answer with the explanation of why not to do this. I know it should be done with a voltage regulator, I am asking if it is possible without it, so answer can be yes/no with an explanation. I am also curious to read about anybody that thinks it is possible. Edit 2: for those interested in the power draw, the EEPROM is a Winbond W25Q64FW and I will use it through a TXB0108 level shifter (side B). For the records, I did not ever try this circuit (in particular after the answers/comments I received) but I am nonetheless very interested in reading what is possible or not. TL;DR; Your friend is telling you how to destroy a battery, potentially violently. Use a proper voltage regulator circuit instead. Batteries are not designed to be used a voltage regulators. While it is true that in an ideal world your proposed circuit would work (after all, an ideal battery drops its rated voltage at any current), in practice things are a little different. All the current drawn from the 1.8V supply will have to flow from the 3.3V supply, into the battery + terminal, then out of the battery - terminal. This is in effect driving a charging current into the battery. The battery is acting as a load. There is a reason that the batteries have a warning "Do No Recharge" printed on them, charging them can cause venting, in a potentially violent manner. Certainly a messy one. Now you will be wondering, but what if I were to use a rechargeable battery. Initially, it would probably work ok. However the output voltage will drop as the battery charges up. The voltage across the battery will keep increasing until either the full 3.3V is dropped across it, or the battery is damaged by over-voltage charging. In any case this will not give you a stable output voltage, as the cell voltage will vary with the current drawn by the load. It is really little different to using a resistor as a regulator, which doesn't work well. The proper solution is to use a voltage regulator circuit. There are many designs. Shunt regulators using Zener diodes, Linear Regulator ICs (e.g. LM317), Transistor series voltage regulators. Let me show you exactly why this is a bad idea to use a battery in this manner. 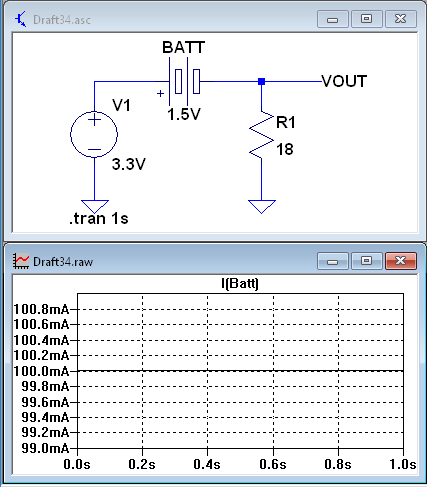 The following simulation shows an example with a 100mA load. As you can see this forces 100mA of current to flow in the battery as well. If you use an alkaline battery this will be causing a charging action which cause an eventual heating of the battery and it may explode or at a minimum burst a seal and leak. If you tried a rechargeable battery technology such as a lithium type it will soon become over charged and these are likely to even catch fire when over charged too much. 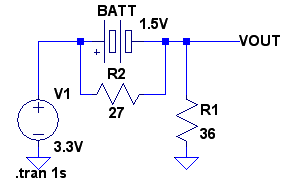 There is a safe way to use a battery to regulate the output voltage in a circuit like this. If you can evaluate your load current requirements carefully then you can place a ballast resistor across the battery as shown below. You must size the ballast resistor so that the battery current is always discharging the battery when the load current goes from zero to whatever maximum current that your load requires. I have shown values suitable for loads up to 50mA. In this way the battery operates as a shunt regulator. The ballast resistor is wasteful of the battery energy but it does achieve the OP's goal of how to get 1.8V for a quick one time application. The output voltage of this arrangement may be a bit less than you might expect. The battery may output 1.5V under a nominal load, but to drive a current back into it may require a small additional potential, which in your circuit, would come at the expense of output voltage. Regardless, what makes this a bad (potentially dangerous) idea is that when you run a charging current into a single use battery, you force chemical reactions to occur inside the battery for which it was never designed. A likely reaction will be the formation of heat and explosive gases which the cell cannot dispose of. This can lead to a build-up of pressure until the cell ruptures (explodes), releasing potentially harmful, corrosive, and/or flammable chemicals. Even using a rechargeable battery in this way is a bad idea, because the voltage across its terminals will vary according to its charge state, giving you a not-very-predictable output voltage, and again, you risk overcharging it with the potential of similar consequences; overcharging typically causes (again) chemical reactions to occur for which the battery was not designed. Rechargeables only charge safely in a circuit designed with that purpose in mind. Are you sure your friend was not suggesting this? A 1.5V alkaline battery is closer to 1.65 when fully charged and not under a high load. And that may be close enough to 1.8V to work for your needs. Consult the spec sheet. Or if this is an inconsequential hobby project, maybe you just build it and see if it works. Either of these approaches will work. Unlike the arrangement you have drawn, they do not rely on running the battery "backwards" to charge it. 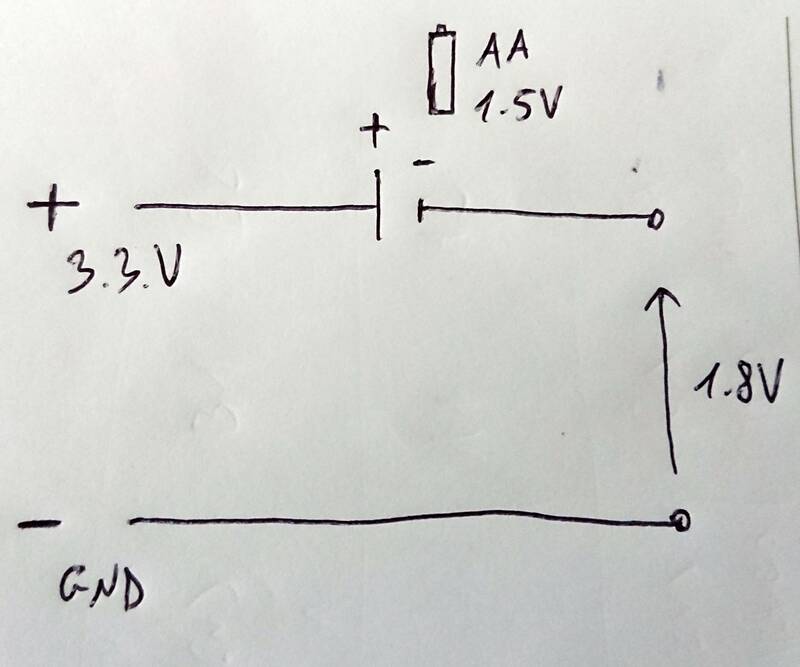 if it's low current, and your 3v3 has sufficient drive, just use a resistive divider- let's say 83r to + and 100r to gnd. The center point will give you 1v8. Yes, that will droop as you draw current and long term it's nasty. But it'll work for the few cycles you need. The reisitor values could be scaled to match what you have hanging around. As described by other answers, the most important thing you have to understand is that you are unintentionally charging this battery. Assuming the battery is not designed to be charged, you are expecting some flames upon prolong usage. Instead of this method, there are many methods that utilise "Voltage Regulators". Take a look at LM334 instead. With proper resistor biasing, you can get perfect 1.8V output. Remember, EEPROMs might misbehave if the power source is not stable. You might be wreaking your head on things for your simple mistake of not choosing a proper power source. If you have a selection of silicon diodes and/or LEDs, these can be used to achieve the kind of voltage drop you need. You might want some resistor parallel to the IC to get the diode forward voltage into a stable section of the curve. Mind that most ICs absolutely cannot stand being driven with input voltages that exceed their supply voltage. If it's a weekend hacking project, I'd say the answer is a resounding YES YOU CAN, until you can get to the shops on Monday. Although you'd be charging the battery at the same time, EEPROMS don't draw all that much current, so you'd be charging the battery at a low current. I've done it myself although not for EEPROMS. Otherwise, do you have a 1.5V zener diode lying around? Not the answer you're looking for? Browse other questions tagged voltage voltage-regulator dc level-shifting or ask your own question. How can I reduce voltage from 40VDC to 5VDC? 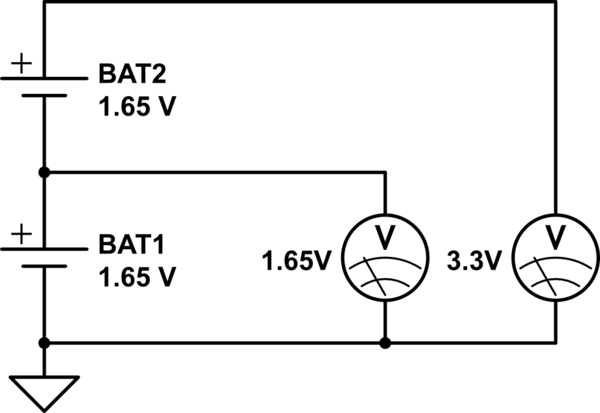 Can we use 3.3V voltage divider circuit from 5V voltage regulator for (800ma load and 3.3v)?